Leonie is a 2012 biographical drama about Leonie Gilmour, a turn-of-the-century American journalist and editor and the mother of famed sculptor of Isamu Noguchi and dancer Ailes Gilmour. 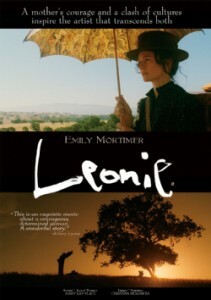 Emily Mortimer is Leonie Gilmour in Leonie. 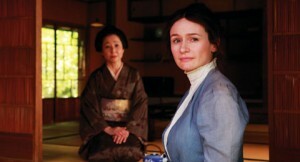 I’d never head of Leonie Gilmour until seeing this film and she is indeed a fascinating character—a Lower East Side New Yorker who falls in love with Japanese poet Yone Noguchi, and ultimately has his child and moves to Japan, where their relationship ends and Leonie makes a life of her own. As portrayed by the always-adept Emily Mortimer (Our Idiot Brother), Leonie certainly appears to have led a life worthy of a bio-pic! For me, though, there was something missing in writer/director Hisako Matsui’s telling of the story. The episodic tale moves quickly and appears to be faithful to story of Leonie’s much-traveled life. But the scenes were a bit too choppy and brisk for me, the result being that the well-detailed period production design and strength of the fine performances (which include an excellent turn by Mad Men’s Christina Hendricks as Leonie’s best friend) didn’t get a sufficient opportunity to sink in and make me care more enough about Leonie’s unique experiences. That said, it is a fascinating life story that’s being told here—and we get to see it up until Leonie’s sad demise. So let’s say I’m recommending the material more than the film that delivers it.